As part of an overnight stay in Derby's Cathedral Quarter hotel we visited the hotel's Opulence Restaurant for our dinner. Opulence really does deserve its name; oak panelled walls, intricate cornicing and ceiling adorned with Italian glass chandeliers really do lend an element of grandeur to this venue. Dramatic monochrome flocked wall paper, heavy window drapes, and unusual high windows add to this visual spectacle even further, with the classically laid tables providing the finishing touch. Fresh bread rolls and butter on wooden platters were brought out to us and we nibbled at them whilst we waited for our starters; His Nibs had the Leek and Potato soup, I chose the charred fillet of mackerel with Fennel purée, Apple, and Dill and Caper salsa. The soup was a very nice example; not overly Leek-y in taste, just a nice subtle flavour of the vegetable against the velvety texture of the Potato. 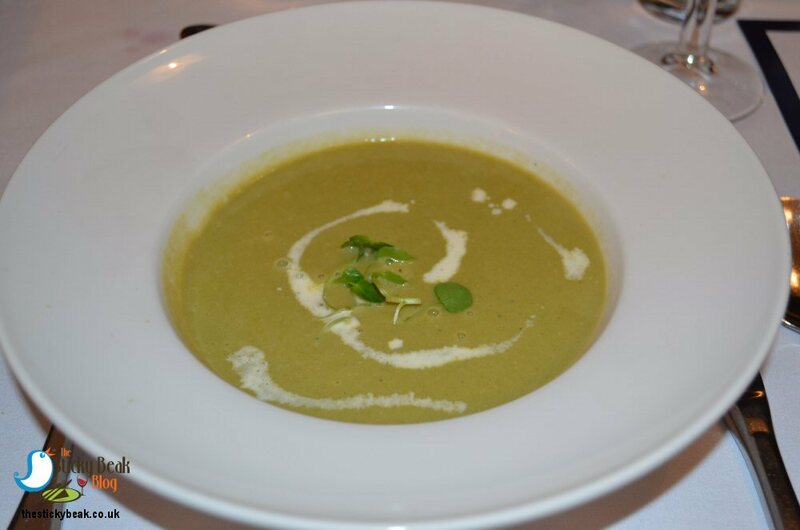 Chef had seasoned the soup perfectly and the Watercress garnish not only looked lovely, but gave another taste in the mouth to savour. My Mackerel was delicious with its lovely moist flesh and lightly crisped skin. 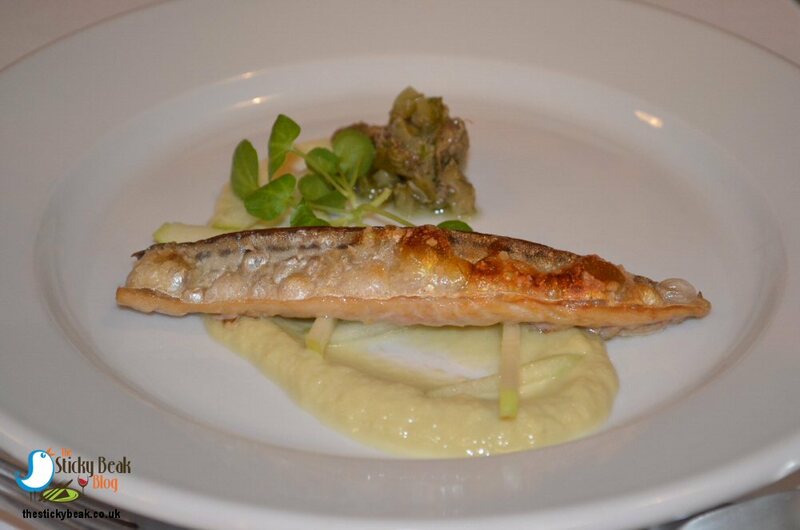 The delicate Fennel purée and julienned green Apple paired nicely together, and the Dill and Caper salsa gave a wonderfully tart, bright note in the mouth. 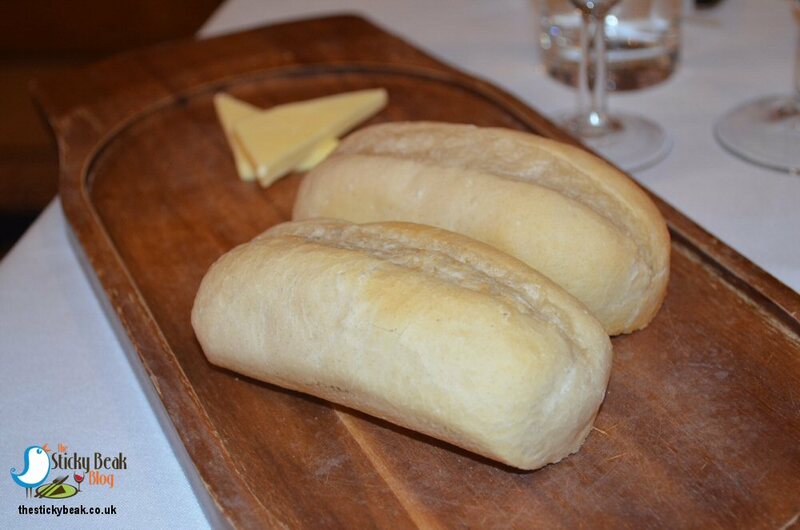 Both starters were very enjoyable, and two clean plates made their way back to the kitchen. Opulence had a sorbet course next, for cleansing the palate, and it was a version neither His Nibs nor I had had before; Spiced Plum. The jewel coloured quenelle of sorbet was presented in a simple shot glass, and gently placed before each of us. The fruit and spice proved to be an excellent partnership, one that was neither too spicy nor too sweet; it did the job of cleansing the palate very efficiently. 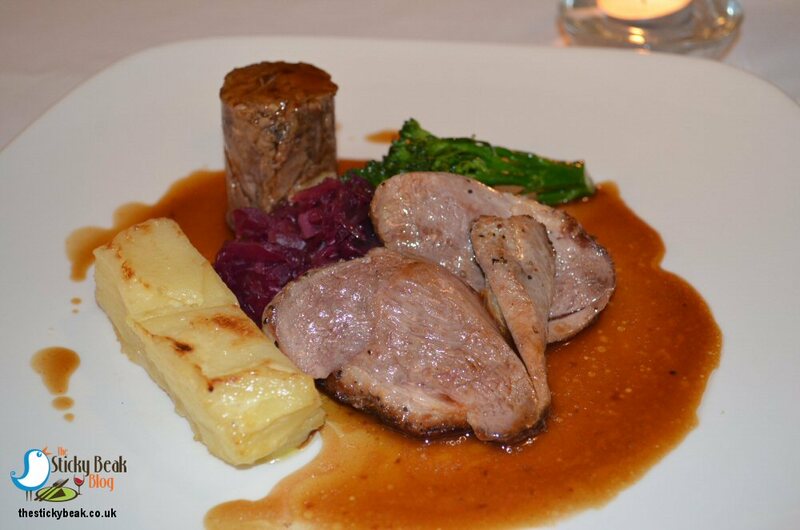 For his main course The Man Bird had pan seared Duck Breast with a confit leg beignet, Dauphinoise potatoes, braised red cabbage, tender stem broccoli, and red wine jus. The breast was served pink, and was wonderfully tender and tasty; the beignet was beautifully aromatic and bursting with flavour. All the vegetables were cooked superbly to retain a hint of their natural firmness and this allowed their true flavour to be appreciated. The red cabbage had a gorgeous light sharp edge to it, and hadn’t been spiced; Dauphinoise potatoes lent an air of sophistication to the dish, and were quite superb according to His Nibs. 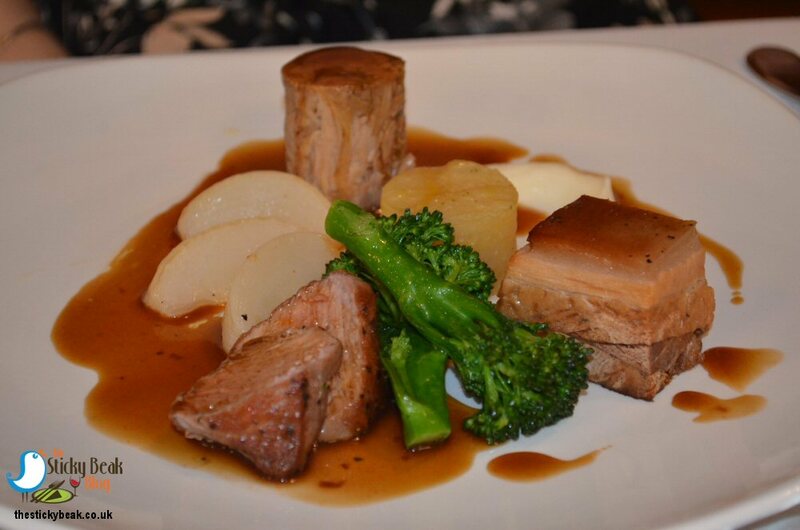 I had gone for the “head to toe” Pork, which consisted of shoulder presse, confit belly, and seared pork fillet served with Celeriac, Cider braised turnips, potato terrine, and jus. All the meat was excellent and the various cuts revealed their own characters regarding texture and depth of flavour. There was a lovely contrast between the ultra smooth, soft celeriac purée and the firmer turnip slices and broccoli. Both mains had been carefully presented on the plates to maximise the colour palate and show this off to maximum visual effect. Throughout the evening Camelia had been consistently monitoring our drinks and refreshing the wine and water glasses as necessary; her attention to diners needs was second-to-none. Clearly manager Sophia runs a tight ship J. I forgot to mention this earlier, but when we had first arrived in Opulence and taken our seats, Camelia had made the effort to find out what kind of day we’d had and whether we’d had to journey far to get to Derby. Sometimes a little effort goes a long way! 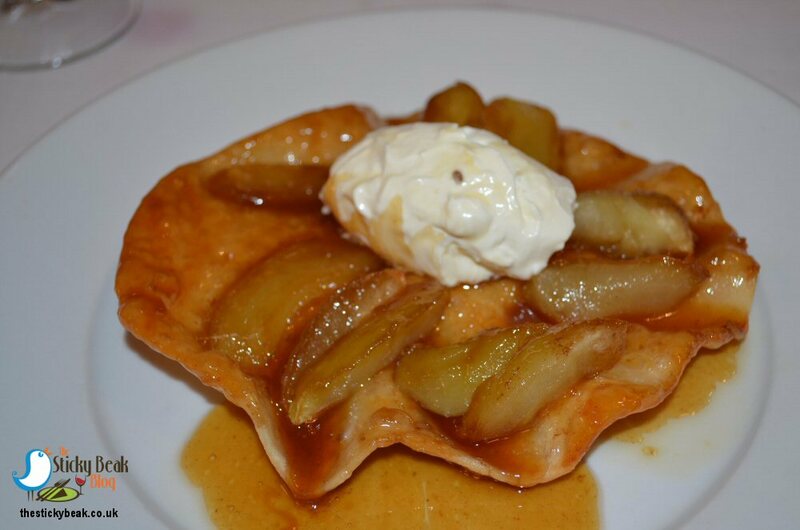 For pudding we opted to have the dessert made for sharing; an Apple Tart Tatin with crème Fraiche and Cardamom. This is made fresh to order and therefore has a wait time of approximately 20 minutes, which was pointed out to us as we ordered. The Man Bird and I never rush our food; when we go out to eat we go out to relax and enjoy ourselves, so the short wait wasn’t a problem at all. The Tart Tatin was a good size, as you would expect for a shared pudding. The light-as-a-whisper pastry had a superb caramel and apple topping; what I loved about the caramel was the fact that it wasn’t too sweet, and it wasn’t overly thick in consistency either. Somehow, it managed to be just thick enough to stay on the spoon when scooped up, but not be claggy in the mouth and as I say, it managed to avoid being tooth-tinglingly sweet as well. Personally I would’ve liked more apple in the tart and perhaps the fruit could have been a little firmer, but these things are very much down to personal preference and that isn’t to detract from the fact that it was a lovely end to our meal. We thanked the team before we headed back upstairs to our room for a quick change, as we’d got plans to hit Derby city’s night life!